This month's Common Thread Give-Away artist is Jon Katz. 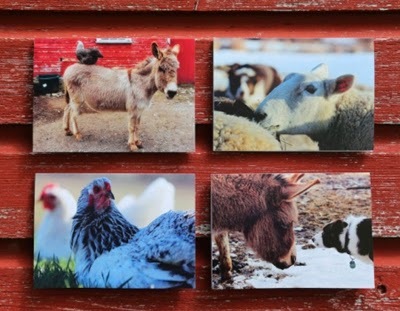 He will be giving away a packet of of his Peaceable Bedlam Farm Notecards. These include four 5 x 7 inch notecards and each is personally signed by Jon. These would make a cherished personal holiday gift, or enjoy them by framing them and decorating your walls with these wonderful country critters or delight your friends and family by sending them a personal note. Each month we feature one of the artists in our Common Thread group and as a thank you to our readers, the artist of the month offers a free sample of their work to the lucky winner of our monthly drawing. To enter all you need to do is leave a message for the artist, and this month, Jon requests that all comments be left on his wife, Maria's website at www.FullMoonFiberArt.com. Be sure to sign up any time between Monday and Wednesday and the drawing will be held at the end of the week and the winner announced. Don't forget to visit Jon's Bedlam Farm website to check out his writings and photography. I start each and everyday with a bit of good news and a wonderful view into his wholesome country life! Our Common Thread Give-Away Artist Group consists of Jon Katz, New York Times Bestselling Author, blogger, photographer and leader of many well-loved groups on facebook; Maria Katz, his wife, blogger, multi-media and fabric artist; Kim Gifford, writer, blogger, photographer, and multimedia collage artist; Rachel Barlow, blogger and artist; and myself, Jane McMillen, blogger, soft sculpturer and sewing artist. Websites are located to the right of this website and can be visited by merely clicking on each artist's site. My Little House Etsy Shop can be accessed by clicking beneath the small pictures featuring my work in the right upper corner. Thank you so much for your interest in our blogs and artwork. Good luck in winning these handsome cards, and know that each first Monday of the month we feature a different Common Thread Give-Away artist who donates a free sample of their work to the lucky winner of our drawing! Labels: Free Give-away contest; Jon Katz is December's featured artist; free packet of personally signed Peaceable Bedlam Farm Notecards to winner of drawing.